Ordering sushi can be intimidating, especially if you are unfamiliar with the food itself. There are so many options that you have probably never heard of, and it could confuse even the most experienced connoisseurs. Nigiri and sashimi are often easily confused. They look very similar and are not the traditional “roll” with which most people are familiar. 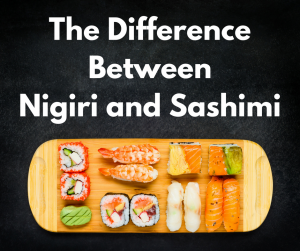 Knowing the differences between nigiri and sashimi is a key step in increasing your understanding of the finer points of sushi. Rice treated with vinegar is a major element in any sushi dish. Nigiri is identified by a small ball of vinegar-treated rice on which the fish or shellfish can rest. Typically, a dollop of wasabi may be on top of the rice and act almost as a paste to hold the fish on top. The fish may be served raw or cooked. Technically, sashimi is not considered sushi. While most people think that sushi means ‘raw fish’ sushi actually denotes the usage of vinegar-treated rice, which is absent from Sashimi. Instead, sashimi is simply very fresh meat, sliced and served raw and often garnished with daikon radish, shiso leaves, and toasted nori. Sashimi does not necessitate fish either. Beef, horse, frog, and many other types of meat can be served as sashimi. Trying new things and experimenting outside of your comfort zone can be enjoyable and rewarding. At Shogun Japanese Steakhouse, we give you the opportunity to try new food that you might not have even heard of before. Nigiri and Sashimi are excellent choices when you are looking to try new dishes. Call us at 407-352-1607 and reserve your table today.